Reserve 2 tablespoons coconut. Stir the mascarpone and confectioners' sugar in a medium bowl. Fold in the whipped cream and remaining coconut. Cover and refrigerate for 30 minutes. Stir the brown sugar and rum in a small bowl. Brush the pineapple with the brown sugar mixture. Heat a nonstick grill pan over medium-high heat. Grill the pineapple for 5 minutes, turning over once halfway through the grilling time. Remove the pineapple from the grill pan and coarsely chop. 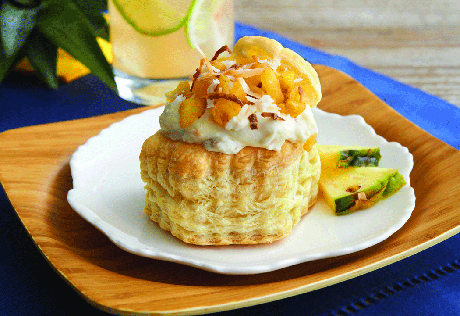 Spoon 2 tablespoons pineapple into each pastry shell. Top each with about 1/3 cup mascarpone mixture and about 1 tablespoon pineapple. Sprinkle with the reserved coconut and the lime zest, if desired.